I transitioned over to it from Hotmail tonight and I love it, but then I’m probably an outlier. I was using Outlook 2013 during the Release Preview and cut over to RTM version Day One. My partner however hates it when Facebook adds a new bar, or Hotmail adds a button, so God knows what she will make of the complete UI overhaul. Well actually, I already know – she’s had a peek at my console and disdain was her first reaction. There’s no accounting for taste (she’s with me after all) but hopefully it will grow on her. Looking at them marketplace implications, I’m sure Microsoft won’t lose many customers over the redesign. People that change adverse aren’t likely to want to go through the disruption of migrating mail service over a mere UI shift. If you’re in that demographic then changing all your logons/accounts is going to be less appealing than learning a new interface. 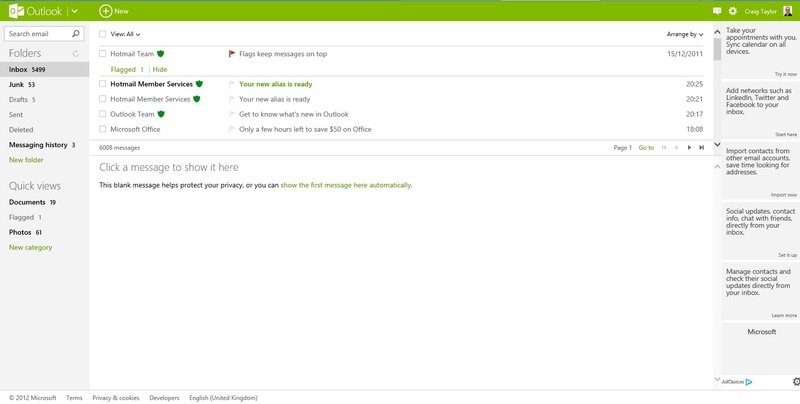 In summary, I think Outlook.com is a fantastic effort by Microsoft. The Hotmail interface was looking very staid and was noisy as Hell to boot, all but driving me into a Gmail account 2 years ago. This dramatic reboot can only generate fresh interest in the service, especially among younger folks who demand aesthetically pleasing web experiences. It’s not quite good enough to make me close down my Gmail account, as no professional aliases remained on Outlook.com for me to grab sadly (thanks the 25 million plus early adopters who beat me to it), but it’s good enough to make me switch my primary back to Microsoft.